Yesterday morning I picked up the newspaper and was pleased to learn that some checks are being diverted to cover back child support, late federal loans, and/or outstanding tax payments. Apparently state and federal agencies can submit lists of debtors to the Treasury Department. Pending payments are then checked against the names and social security numbers on the list and redirected if necessary. So far, nearly $1 billion in stimulus checks have been diverted to pay outstanding debts, and this number is expected to grow as the government continues mailing out checks (they’re only about half done). Thus far, 55% of the confiscated payments have gone to child support, 39% to federal debts such as student or farm loans, and 6% to unpaid state taxes. 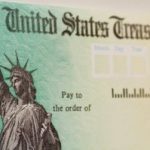 If you haven’t received your check yet, it might be that the Treasury Department just hasn’t gotten to you yet. Alternatively, if some or all of your payment was redirected to an outstanding debt, you should receive a letter explaining why it was reduced or erased. Why Didn’t I Get My Tax Refund? Damn those civil liberties. What were the founding fathers thinking? Income tax is unconstitutional, plain and simple, so what gives the IRS the right to divert stimulus checks to cover back taxes? Child support payments are a local and/or state court matter, between parents of children (and judges, if need be). A federal agency has no business in the court system. Moreover, classifying all those who owe child support as “deadbeats” is about as illogical as classifying all Mexicans as lazy. It just doesn’t wash.
As for federal loan payments, it is a shame that monies borrowed cannot be repaid directly to the taxpayers and lenders responsible for the loan funding. Since this is the case, unfortunately, one must take responsibility for one’s financial decisions and not eat too many sour grapes over losing money to repay what was borrowed, even if it only goes to Uncle Sam’s coffers. In a truly just America, stimulus rebates would only go to those who owed no legitimate debt to the federal government, and then only to those who had an actual tax liability (i.e., those who had not received a 100% or greater refund of tax paid), and then in the total amount of tax paid to the IRS, minus any refunds previously received. In the America in which we live, people who have never had a dime of their hard-earned cash robbed of them in taxes, who would just as soon spend child support payments on booze as children’s clothing, will be given so-called free money out of the ledgers of those who have dared to earn too much; our federal debt will continue to soar; our currency will continue to be devalued; and these itty-bitty spit-in-the-bucket payments will do NOTHING to “stimulate” the economy. They should do this for all sorts of debts. If people were forced to pay back their debt then we’d see a more healthy society and people with far better futures. I am sure also people who are debt free are far happier and less stressed than those carrying huge loans, cc debt, and so on. This should be standard procedure for all rebates, refunds, and the like. Hell I even feel people should have to use inheritances and windfalls to pay back any outstanding debts.. but then there are these little civil liberties we have to protect. I think it is a great Idea…For dead beat dads. I on the other hand live in a diffrent state then my children. I talked to the mother of my children and she told me she had filed for child support and that her state needed my Information. So being a good father I called the Child support agency in her state and gave them all my information because I feel I owe money for my children. It took them a few months to processes the information then they sent a request to my state who took a few months to processes the information. they set up a court date. over a year after she filed for the support in which time I was already buying her diapers and such and birthday gifts and christmas presents and formula and everything cause their mom does not have a job and is living off the state but refuses to get food assistance wants me to pay for it all. so right off the bat I already owe more than $2000 I already don’t have since I have already been spending all my extra money on my children. which the support now cuts my paycheck from 800 dollars bi-weekly to 300 bi-weekly. so not only am I behind on all my bills but am struggling pay the rent and am borderline homeless. extra money is already taken automatically out of my paycheck to pay back child support. so how suprised was I when I found out that not only does the mother of my children gets all the tax money from both my children for earned income credit and stimulus check for both children and my 900 dollar tax return and my $600 stimulus check so she gets $8500 dollars all at once and I am still struggling and she wants me to pay more when I am already paying more then is legally allowed to be charged to me by both the state she lives in and the state I live in. So yes I think it is a good Idea to take the stimulus checks and tax returns from dead beat dads who don’t do anything for their childre not guys like me who are willing to pay every cent he owes and is happy to do so. Look times are tough for alot of people. I pay $4.00 for gas in texas. Everything is going up because of fuel costs. It cost me 20.00 bucks a day to get to work. That little check to you, may be the difference between whether someones mortgage gets paid or not. Or if a important bill like tuition or electricity gets paid or not. I have no beef with the government doing this to Dead Beat Parents. They should pay if the kid is theirs for sure. But other people don’t deserve this. It’s easy to judge and criticize the non child support poeple for having outstanding debt, but always remember your perfect, rosey life you have right now, can change on a dime. Give these people their money if they don’t owe child support. That’s the government, kick’em while their down and spend billions on a pointless war. Definitely a good idea. If you put yourself in this kind of debt, you can’t blame it when people go after your money before it gets to you. I am in agreement about being skeptical about how this whole thing really works. But I am curious to know what people think is a better option? I’ve thought about a few things myself, but not in any detail. I agree with Steve Olson. This isn’t so much an ‘economic’ stimulus as it is a banking industry stimulus. Where are they mailing these checks for people who already lost their homes? Anyway, I received a $122 payment that I turned around and gave the government for a series I savings bond… Just days before they changed the interest rules for these — LOL. I am with Kevin… kinda. I am against the whole idea to begin with, but if it is truly a stimulus plan, paying off debt won’t stimulate anything, especially government debt with more government debt. Here in Minnesota many fathers pay child support to the county government who in turn give welfare, food, and housing benefits to the mothers with children. So this is federal debt going to pay off other branches of government. That is just pushing dollars around and does nothing to create economic activity. I hate to say it, because it doesn’t fit with a social conscious, but buying a plasma screen TV creates economic activity. Doesn’t make it right, but it is still an economic fact. If I actually believed in government stimulus spending like this, I would have to assume it is supposed to stimulate economic activity like consumption, production, or investment, which spurs growth that exceeds the debt incurred. However, I don’t think it ever does that. But that is the logic. 2. Early May comes and goes and I get a letter (this one from my Congresswoman; the first was from the IRS) telling me how wonderful it is that I am getting a stimulus. How much did this mailing cost? More or less than the first? How about the check and less self-congratulations about sending me my own money back. 3. I get another letter last Friday saying that–no matter that I had indicated my direct deposit info on my 1040–since I owed taxes on my 1040, I would be receiving my stimulus via check in about 6 weeks. Thank you for this additional unsolicited letter at a cost to the government, ahem, me, of ?? 4. My entire stimulus payment is direct deposited into my account earlier this week. Does anybody really believe someone would have told me the answer and be doing anything other than guessing? And my situation is about as straightforward as they come. No liens, no moves, no new accounts, on-time tax filing. Kevin: It sounds like you have a beef with the rebates themselves, not with how they’re being applied. I also have some trepidation about the government handing out money that it doesn’t have, but… Given that it’s going to happen, I’m all for redirecting it in cases where people have skipped out on their obligations. You cringe at that money going toward child support debts, etc, but you’re ok with it going to buy plasma tvs? I think what you mean to say is that you are against the idea of a rebate altogether, which is completely understandable. However, if the govt wants to help me pay down my mortgage again, I won’t say no. I lean left on many social issues, but mostly right on fiscal ones. When I hear that stimulus checks are being diverted to pay late child support or pay off federal loans, I cringe. I like the fact that the people are not getting the money, but I am essentially paying for someone else’s child support with my federal tax dollars. That is a horrible feeling. OK, my stimulus check should have arrived two weeks ago. The IRS website said it may be delayed, but I got a letter the week I should have received my checking telling me I would receive it on Monday, June 16. Should I be concerned? Using the money to pay back child support was a fantastic idea! Since those deadbeats can’t help support their own children then the windfall from Uncle Sam should! And I’m qualified to make that comment because my own father skipped out on payments for years, causing additional strain on my mom. I think this is a great idea. Especially for those that are behind on child support payments. I don’t see why they should get a check back free and clear if they haven’t kept up with their other more important obligations. MBL: It should be applied exactly as a “regular” payment. If that means some goes to interest, then so be it. Why should someone catch a break because they failed to meet their obligations and then the feds stepped in to recapture the lost money? What I am curious about those stimulus check being used to pay down debt is how much of that debt is interest they are paying down. I can see where using it to pay down principle is good but using it to pay down interest seems like something is wrong here.